You might know Matt from our Rosewood store. He has recently undertaken a fitness journey of his own. 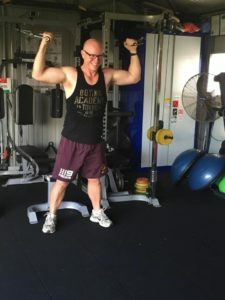 When Matt turned 40 he thought it was time to do something that would better his health in the long run, so he decided to be more active, eat healthier and put his health first! Matt to date has lost over 13kg and over 15% body fat. But enough about the numbers, most importantly Matt is feeling fitter than ever, his muscle mass has increased, endurance has improved, energy levels are much higher and his overall fitness is far better. You are a very busy man, how do you manage to fit consistent exercise and eating healthy in? It’s important to schedule time and stick to it and not make excuses to miss working out or eat poorly. I tend to work out early in mornings as that seems to fit in best with work and family commitments. The key to eating properly for me is to be organised and plan what I’m going to eat and when, ensuring my meal prep is done before hand to save you time. What does your weekly training schedule look like? I do 5-6 training sessions a week. This includes two strength training and a Metafit session with a local personal trainer and two to three sessions at home. What sort of diet do you go by and what supplements do you use? I try to eat quite clean so I try to avoid processed foods and try to limit sugar where I can. I do use a protein powder to make shakes which I take after a workout. I also regularly take multivitamins and CoQ10 which is a powerful antioxidant. If you had one tip for someone looking to kick start their fitness what would it be? Just get started. Less thinking about it and just do what you can. Even the best you can do is better than nothing. It will be a shock to your body at first but you will see improvements quite quickly, so stick with it, it will be worth it. Congratulations on all your hard work.